I don't think I ever truly liked the name Hired Guns, this being one of DMA Design's Amiga games and one of the key things that I usually get hung up on whenever the subject arises. The history of the project was somewhat troubled from my own perspective, even though I am still stupidly proud of my contribution and occasionally get misty-eyed over it. Troubled, because of what happened after I spent over a year writing the background, story and characters. It was going to be my first published story, really published, really genuinely making me a proper author. This was going to be great! I iz a writer! I sent the final copy to Psygnosis, who were demanding it at as soon as possible. They then sat on it for a whole eleven months, before rushing to get the booklet printed by an outside company with only three weeks to go before the release date. At no point did they offer any comment or criticism during that time. 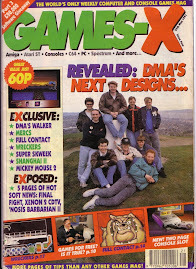 And then the game was released and the first chance I had to see myself in print was tearing the cellophane wrapping from the complimentary copy I'd been sent, lifting the lid and leafing through the booklet. Where all the punctuation was missing. Worse than that, if possible were the instructions for actually playing the game. Scott Johnston, the designer and programmer, had written pages of notes and given them to Psygnosis who were to write the instruction booklet with the purpose of saving time while I fretted away at the background material. Only they'd taken his notes and pasted them in wholesale, entirely unedited. I tend to get protective of Hired Guns these days, to the extent that I imagine that anything I have to say on the subject of the story is definitive by definition. And where this impacts on Wikipedia, the results have been interesting. I never created the Hired Guns entry but I have edited it to incorporate the description of the story, the description of which is simultaneously factually accurate, completely wrong and occupies that strange blurry interface between fact and fiction. So ask what the Hired Guns story is about and the truth gets slightly odd. Let's start from the outside, and work our way in. On the packaging, the box which contains the disks and the booklets, it describes the characters as fighting “mutants” and since the outside packaging is the one that's most familiar to anyone – and easiest to research - that ought to be definitive. It's there in plain sight after all, and the packaging is not hard to find on the net as a scanned image. For Wikipedian purposes, it's as easy and uncontroversial a citation as you could wish to find. But it's flat out wrong. Inside the box however there's the manuals (which I wrote – this is my background story after all) and the creatures described therein, which the main characters encounter, are not mutants. They are genetically engineered weapons. It's not just a piffling quibble over semantics either; why this is important is why the characters are there. So far it's just a mismatch of info, someone at Psygnosis got it into their heads that it was all about mutants, or perhaps it was even deliberate because “mutants” made for a better soundbite. I'll likely never know. But where it now gets interesting is with Wikipedia's description of the story itself. Within the game itself, the mission centres around the task of locating four nuclear warheads “backpack nukes” and blowing the crap out of the place to kill all the beasties. But this is not what Wikipedia says. There it tells us that the story is about a hostage rescue which proves to be illusory and is only planted to lure the mercenaries to the planet for a live test of illegal bioengineered weapons. The whole thing is a trap: the planet is a weapons proving ground. But none of that appears in the game. So how did such an obviously incorrect description get into the Wikipedia entry in the first place? Where is the source for such an outrageous assertion? How did something entirely out of left field come to be parading itself as “fact”? This one is rather easier to track down, because it was me who put it there. So does that mean I'm just proving a well-trodden point about the accuracy of Wikipedia and that the story description is plain invention? An “aha, gotcha” motive made possible by stunt-editing? Well it gets a bit blurrier here too. It really is a genuine description, but of Hired Guns' original plot, before it got hacked to shreds. Limitations of memory in the Amiga meant that not everything we'd intended for the game was able to fit in. As you can guess, it was the story which had to be substantially changed so that it could be described in less memory, with less demands on custom code and graphics; with appropriate amounts of complaining on my part. I'd even written a large diary entry on that day that was decided (it was 12th Feb 1993) and it was fittingly enough pouring with rain, moulding itself snugly around my black mood. Even so, there are still fossilised clues to the original story contained within the games dialogue and within the manual. Hell, some of the dialogue I'd written was there purely to foreshadow the next four games which I'd been sure were in the bag. Intergalactic non-persons? Mutation producing plant? Artificial planet??? All that came out of nowhere and is completely wrong. But where it gets interesting for me is that after my correction, no-one has contested it: it is assumed to be the self-correcting mechanism in action. Perhaps it's just a minor game out of the many thousands out there and no-one cares, or perhaps piracy was so rampant that very few possess the physical manuals to fact-check with. Maybe no-one really cares, and if that's the case then what does the truth matter? In the end, a fact may be more fluid and nebulous than we'd like. Yet the original story as I described it survived intact for the planning of Hired Guns 2, even to the last-moment addition of an extra planet in the manual. Whatever the finer points of semantics or philosophy, I consider the original story to be the real one. After five games (yes, I was optimistic) the background elements of the story arc would have come to the fore with a huge payoff. That resolution, so far, has existed only in my mind. Not on paper. And how on Earth could Wikipedia have a citation to that? Cool blog, I hadn't noticed snap2grid.blogspot.com previously in my searches!